Photographer's pick of the top Australian landscape photos. Framed, Unframed, Canvas, Posters, Cards and more! Find out what makes the photographer tick. A journey of photographs and text describing some of Australia's most scenic natural landscapes. 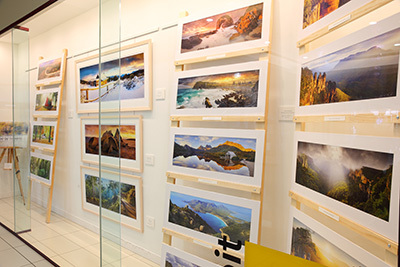 If you would like the opportunity to check out Michael's photography in person, a range of prints can be viewed or purchased in Bendigo, Victoria. Email michael.boniwell@gmail.com or Phone: 04 3473 0828 to make an appointment. Surrounded by a white mat and roll mounted on adhesive foamboard for zero slippage the following hand titled & signed prints can be viewed and purchased in person. Ready to frame, or simply display as is. The Warrumbungles National Park is in central New South Wales not far from Coonabarabran. Once part of a large volcano that erupted millions of years ago there are now popular hikes, some taking walkers into the "Grand High Tops" region of the park. The tracks are often quite steep, but very well maintained. Arriving near midnight I hiked in through the dark to avoid carrying camping gear as well as my heavy photography kit. Familiarity with the track boosted my confidence, or possibly it was the biting cold making me walk faster. 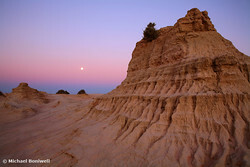 In any case I arrived at the Grand High Tops well before dawn, the huge shape of Crator Bluff just visible in the moonlight. I set my alarm, and lay down to sleep on the rocks, trying to find a flat bit out of the wind. It's amazing how easy it is to drift off even so far some the comforts of our daily lives. Sunrise brought with it a soft rosy glow that gradually illuminated the bluff, the fast moving clouds reflecting the pink light. "As a photographer and avid hiker there are many places that are dear to my heart. Places I've returned to time and time again just to breath the air, taste the cold mountain streams and basically drink in the natural beauty of the Australian landscape. The feeling of being revitalized by these splendid wilderness environments sadly leaves all to quickly upon returning to the mundane world. The photos shown below hold for me an emotional significance, somehow prolonging that energy." One of my favourite landscape photography subjects is the rustic mountain hut, the older the better. Australia is home to many high country mountain huts, from Kosciuszko National Park to the Victorian Alps and down through Tasmania's National Park system there are literally hundreds of them. Each has a story to tell. Sometimes it's a tale of alpine cattlemen and hardship, or a rich history of a sheep & cattle station and it's homestead dwellings. Other huts were built more as outposts to help hikers and cross country skiers survive the wilderness. Some mountain huts were even constructed as a film set, like the ever popular Craigs Hut on Mt Stirling, one of my top landscape photography destinations. Regardless of the heritage, there is something primal about a mountain hut. It speaks to our hearts of warmth and safety in the face of remoteness and solitude, and evokes a certain romanticism, a nostalgia for the past. Uluru (Ayers Rock) has an iconic association with the Australian outback. So much so that the image of the red rock blazing in the sunset or sunrise (pictured) is probably the most well recognized Australian landscape from an international perspective. Residing pretty much in the centre of the country it's surrounded on all sides by hundreds of kilometers of flat desert. It rises out of this barren plain, a massive single hunk of rock that dominates the senses and leaves the hundreds (possibly thousands) of tourists that visit it daily awestruck and firing off shots like landscape photography was their bread and butter. Yulara is small tourist town and exists 20kms from the rock. It has an airport, shops (including a small supermaket) and caters to the needs of the many world travelers with accommodation ranging from camping to luxury resort hotels. Australians also visit in their flocks, many preferring to use camper vans to tour the country. Melbourne to Uluru takes 2 days driving, 12 hrs per day. Kata Tjuta (The Olgas) is only 50kms from Yulara and definitely worth a visit. It has two good walks, including a 3 hr trek that takes you through "The Valley of the Winds", winding between the massive mounds of the Olgas themselves. For day walkers access to Dove Lake (pictured) is easy, with a sealed road right to the lake shore. More serious hikers wanting to strike out for the likes of Barn Bluff, Mt Ossa (Tasmania's highest peak), and on to Lake St. Claire will need to allow three or four days walking in a good climate. While there are huts, a tent must still be taken in case of crowding or weather issues. For those who like their nature experience less bold or lack the fitness I'm told private companies offer guided treks with more up market accommodation along the trial, hot meals, your packs carried for you, etc. Tasmania's Cradle Mountain National Park would have to be the cream of the crop for hikers who visit from all over the world. As a Australian landscape photographer I could not think of a better place for Australian landscape photography. For a less crowed alternative, try the Walls Of Jerusalem National Park, an equally picturesque trek. The soft sandstone of the Three Sisters tower over the Jamison Valley like silent sentinels, a beacon to would be landscape photographers. They are probably the highlight of the Blue Mountains in New South Wales, Australia not far from Katoomba. Only an hour so from Sydney they really are a popular and well loved site, with people lining the railings waiting for the golden light of sunset to lift the colour of those rocks and snap that iconic landscape photo. From Echo Point nearby a walking track leads to the Three Sisters and down to the valley floor via stone steps known as "The Giant Stairway". A 1.5-hour walk on The Federal Pass trail leads to the base of Katoomba Falls. The Blue Mountains offers quite a range of choices for those interested in waterfall landscape photography, with possibly the prime attraction being the spectacular Wentworth Falls. At 187 meters these falls are broken into three sections and fed by Kedumba Creek. An "must do" day walk, one I'd rate in the top five in Australia, uses the "National Pass" trail to explore the Upper Wentworth Falls area and then navigates along under the cliff-line to more falls, eventually looping back up onto the ridge. The views across the landscape are simply amazing and the track, while steep and very exposed, is extremely well maintained. I'd go so far as to say, if you've time for only one short walk in the Blue Mountains, this one should be top of the list. Is it kid friendly? Well sort of, if you're prepared to keep a close hold of them in places and maybe carry them up some steps. For the more fit there are plenty of additions to the National Pass walk that explore deeper into the valley. Mt Kosciuszko, Australia's tallest mountain isn't exactly comparable in height to the mountains of Europe or even New Zealand, but it does offer some very pretty terrain in a very accessible fashion, perfect for landscape photography. An easily navigable tourist track made from metal boarding leads from the top of the Thredbo chair lifts right to the summit and will keep your feet dry while protecting the delicate alpine grasses. Even in the snow season the track is a breeze to walk (assuming good weather) making the summit something to which most can aspire. Curiously however, the summit sunset is something often missed by day walkers who wish to depart while the light remains strong. In early summer the place comes alive with alpine flowers, and in winter the snow capped neighboring peaks offer a grand vista, and a marvelous background for landscape photography. Aside from the usual hiking and skiing, mountain biking is also a popular recreation at Thredbo. Even ice climbing is possible, albeit on extremely short routes at the nearby Blue Lake, while the approach to Thredbo offers many quiet campsites for car campers and families such as GeeHi Hut. A circuit hike (or x-country ski in winter) can be done by parking at Charlet's Pass and walking up the road to the summit, passing Seamans Hut, then following the foot-track along ridge-lines back down via Blue Lake. This is a much bigger undertaking than simply following the tourist track from the Thredbo chairlifts to the summit and back. A delightful place, Kangaroo Island is just off the mainland of South Australia, below Adelaide and well recommended for landscape photography. Access is via a 45 minute ferry ride, which will accommodate your car. Don't underestimate the size of the island, you need two or three of days to see everything. Along with a diverse population of wildlife it's also home to the oft photographed "Remarkable Rocks" in the Flinders Chase National Park. The precariously balanced group of granite boulders, some as tall as a house, light up their sculptural shapes with colour at sunset and sunrise offering amazing views. There's also the Admirals Arch with an adjacent fur-seal colony, a couple of lighthouses, beaches, nature parks, and little seaside towns to explore. Victoria's "Great Ocean Road" encompasses a vast breadth of coastline taking up much of the south-west of the state. All along the windy road motorists are spoilt for choice when it comes to great coastal views perfect for landscape photography. The most popular attractions are "The Twelve Apostles" (pictured) and other various formations such as London Bridge and Loch Ard Gorge. Many of the rock formations have sunk into the sea over the years with the famous "12" now being several less than a dozen. Never-the-less the spectacular scenery is a paradise for landscape photographers. An anchor is all that remains of the Marie Gabrielle which was shipwrecked many years ago, but now offers a fun short beach walk for those willing to brave the tides, while places such as Port Fairy offer historic charm and windswept beach treks. Further inland the Otways provide extensive forest walks and waterfalls. The Flinders Ranges are the largest mountain range in South Australia with the most popular area being Wilpena Pound, a vast natural amphitheatre of protruding peaks the highest of which is St Marys. Millions of years of erosion has created a landscape that is harsh, dramatic and strikingly beautiful. The many cliffs of exposed orange rock tend to turn almost red at sunset. In my younger days these represented an irresistible destination for rock climbing adventures with mates. I've been back numerous times since with camera gear instead of climbing gear and will no doubt return several more times yet � it's that kind of place. Quiet yet alive with wildlife if you look closely. Unforgiving in the blazing sun, yet rewarding at every turn in the track. Towering crests that demand your attention followed by desolate plains still enveloping and serene. For first visitors "The Pound" (i.e. Wilpena Pound campground), is the place to start. Here you can purchase a parks pass, buy petrol and food, find basic accommodation and avail yourself of the helpful info centre staff to plan walks/4wd trips and even charter a flight. Bring heaps of water, and avoid summer when the flies and heat are a bit much. Wilsons Promontory (or "The Prom" as it is known) resides on the southern most point of Victoria and offers a wealth of opportunities for Australian landscape photography. Tidal River runs out into the ocean at a place known as Norman Bay where campers, hikers and sightseers congregate in numbers and for good reason. The park has a stunning natural beauty, a wealth of wildlife and many good, well marked walks. Having hiked all day and carried no less than 10 litres of water with us (the streams are stained black from bracken), we slept soundly indeed, but my lasting memory of that trip is still the unspoiled beaches perfect for landscape photography. I've returned in the capacity of a photographer rather than a hiker, many times and still there are photographs on my to do list. Falls Creek is a popular skiing destination for both downhill and X-country enthusiasts as well as being a haven for landscape photography opportunities. For hiking (or snow shoeing in winter) an adventure not for the faint at heart can be had, by using the trails that run from Mt Beauty village, up the murderously steep Mt Bogong staircase, down the opposite side, through the icy river, up again to Falls Creek alpine plateau, and all the way across to Mt Feathertop and Mt Hotham - a journey of several long days even in good weather. One highlight of the Falls Creek area and accessible by car in summer is Wallace's Hut (pictured). It is the oldest still standing alpine hut in the Alpine National Park. Accessibility drops in winter requiring a snowshoe or X-country ski trip, though the distance isn't that far from Falls Creek Village. Twisted snow gums shadow the hut surrounding it with a mythical quality and enhance its appeal both historically and as a subject for landscape photography. The interior of the hut doesn't lend itself to a means of accommodation even for weary hikers, but the locale is a poplar campsite for the tent bound and sports toilets and a nearby fresh water stream. Victoria's Alpine National Park is a huge area encompassing such peaks at Mt Hotham (very popular for skiing), Mt Feathertop (a great over-night walk), and Mt Howitt with the amazing "Cross Cut Spur" ridgeline trek perfect for an epic landscape photo in almost any weather. The park also offers a maze of four wheel drive tracks, many accessible from the town of Licola, that is very used to being inundated with off-road enthusiasts. "The Razorback" is a ridgeline that runs from Mt Hotham to Mt Feathertop. It's actually one of the easiest alpine hikes in summer (winter is another story) if approached from Hotham, and makes a great place to start exploring the trails. There's also quite a few mountain huts to be found. When it comes to landscape photography, I'm a sucker for a good mountain hut photo, and will hike a long way to track one down. Victoria's Mt Buffalo can be overlooked during winter in favour of more popular skiing destinations that also have a proximity to Melbourne such as Falls Creek, Mt Buller, Mt Hotham, etc. 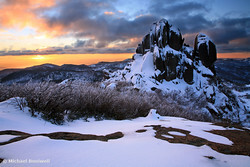 However Mt Buffalo offers some unique mountain attractions that really appeal during the warmer months as well. These include the grand old Mt Buffalo Chalet along with stunning views across the north gorge. Numerous well marked walks big or small wind right through the park making landscape photography and nature photography a genuine pleasure. Excellent summer swimming in Lake Catani with a kid friendly camping ground nearby that includes hot showers. Rock climbing, caving, horse back riding, abseiling - the list goes on. Waterfalls, and granite tors abound. It really is a gem of a place and not just for landscape photography. And as I say, somewhat overlooked so crowding is not an issue except around Easter where it pays to book ahead for Lake Catani camping. Enjoy! The Grampians National Park is a vast, mountainous and heavily forested area residing a comfortable 3.5 hours drive west from Melbourne. It's perfect for landscape photography and is extremely popular around Christmas and Easter with up-market accommodation in the very pretty Halls Gap tending to fill up fast. Outside those times you won't have a problem and being a National Park you can always pack a tent and camp in any of the well marked free sites. The park offers some grand views, notably of rocky outcrops and cliff-lines as well as waterfalls and lakes. Native wildlife abounds. So much so, that you'll need to slow right down on the roads. Roos and Emus can leap out at any moment. Generally you'll find toilets and picnic tables in most of the marked destinations but often there will not be tap water, so BYO. In terms of things to go look at, I'd recommend you tick McKenzie Falls, Boroka Lookout and The Balconies first. They are all very accessible, lined up along the same road, basically minutes from the car. Boroka overlooks Halls Gap and its practically a stones throw from the carpark. McKenzie is a steep but short walk, and The Balconies is a couple of kms, but very flat easy walking. If you want a walk taking a couple of hours instead of minutes, head up to the Wonderland area and tick the Pinnacles via Grand Canyon. It's very popular so expect to share the track, but worth the walk and only a short drive from Halls Gap. After that, if you have time left and still want scenic views, consider the amazing walks around Mt Stapylton in the north of the park. For example, with a couple of hours up your sleeve, start at Flat Rock and head up to to Taipan Wall where the Rock Climbers hang out, then circle around to the summit ridge for amazing views. Alternatively, Mt Rosea in the middle of the park, has some grand views and really isn't that hard a trek, though you'll want to take water and food and have time on your side before dark. Or head south and check out some of the caves and rock art in the Victoria Range. You will need to take on some sandy dirt roads and much longer drives, but there's lots to explore and an endless supply of landscape photography opportunities. Have fun! Phillip Island is an easy day trip from South-East Melbourne offering the city dwellers "a quick trip down the coast" with a chance to commune with and partake of some real Australian nature and landscape photography. The Island boasts some of the best waves for surfing as well as the popular wildlife reserves where creatures such as native Australian penguins roam wild in the surf at night. The windy Isle is also home to seals and kolas. An easy three quarters of a hour walk along Cape Woolami will get you to The Pinnacles (pictured), with its impressive red rocks and thundering waves, a place where landscape photography seems almost mandatory. Native birds nest all long the point literally turning the sky black with their numbers at certain times of the year, as they dart every which way somehow avoiding head on collisions, and budding nature photographers alike. Australia is home to many historic lighthouses. Some of them are in very remote or picturesque locations and as such they make for interesting subjects for landscape photography. There is also a certain charm to them. Maybe it's the idea of living in one, all alone against the raw elements of nature. A single heroic figure, shining light in the darkness. As photographic subjects they can be challenging. Often the off-shore wind can be ferocious. Sea spray and cover your lens, the rocks can be slippery and the incoming tide a danger. Like most things in life, the secret is pouring more time into it. Presented here are the Australian lighthouse photographs I've created over the years. Some of them I've returned to dozens of times, and will hopefully continue to do so for years to come. Lamington National Park resides in the southern end of Queensland, near the New South Wales border. There is no shortage of hiking to be found here. Tracks take you out to the "Scenic Rim" a series of plateaus and cliffs with great views while deep within its forests lie a wealth of rivers and waterfalls, among them the beautiful Elabana Falls and Chalahn Falls on the 15km Toolona Creek Circuit walk. The Lamington spiny cray (Euastacus sulcatus) is a freshwater crayfish that you might spot along this walk. It looks like a blue yabbie. Having explored several of the many waterfalls here over the years, this little creature is always fun to spot. There's also Morans Falls that plunge 80 metres to the valley floor and are an easy walk from the road just before you reach O'Reilys Rainforest Retreat. Forming part of the Gondwana Rainforests of Australia World Heritage Area, the vegetation is lush to the point of being sub-tropical. You'll see some impressive trees along this path. Even the drive in is so surrounded by amazing specimens you'll be impressed long before get your walking boots on. Once you're done, it's only five minutes drive to the cafe at O'Reilys, which has accommodation options as well. There's a real wealth of superb hiking tracks here to explore, particularly if you like waterfalls and deep forests. The eleven peaks of the Glass House Mountains rise abruptly from the otherwise flat countryside of Queensland's "Sunshine Coast". The tallest is Mount Beerwah at 556m, but my favourite is Mount Tibrogargan on which I've done a little rock climbing in my younger days. Only about an hour's drive north of Brisbane the Glass House Mountains are a popular tourist destination and offer great walks on Mount Tibrogargan and Mount Ngungun and several little townships to explore. There's also the famous Australia Zoo founded by Steve Irwin and his family. I can recommend Wild Horse Mountain Lookout to anyone who is passing through the Glass House Mountains and wants a short, though steep, 15 minute walk with a great view. There is a shelter on the top, which makes an excellent spot to keep out of the sun or rain. If you want something more challenging try the Mount Ngungun summit walk. At 2.8km it's not going to kill you, though take plenty of water. Mungo National Park resides several kms well north of the Victorian-NSW border in a remote and desert landscape called the Willandra Lakes World Heritage area. Access is not recommended without a 4 Wheel Drive, particularly after any rain, which causes the great many km's of rough sandy tracks to become almost impassable for a sedan. You will need to put some thought and preparation into this drive. Having said that, the eventual goal, Mungo National Park, is home to some pretty amazing scenery, that makes for some real outback landscape photography. The 33 kilometre "Walls Of China", made of eroded sand formations (pictured) and the endless sand dunes surrounding it make for some interesting exploration. The Mungo Woolshed offers a glimpse of life on the land in some pretty harsh and arid conditions. As a landscape photography location, it's problematic, but worth the effort.